His name is Robert Paulson…wait, sorry – thought this was a movie blog for a second there. Sometimes musicians have careers in television or film in addition to what they do in the studio. Today’s artist is no exception, with the general consensus being his success was more as an actor. However – all of us may turn surprised to hear he’s sold more than 80 million albums worldwide. Marvin Aday was born in Dallas, Texas in 1947. Being the only child of a school teacher and police officer, he led a difficult childhood. Dad was an alcoholic who’d go on drinking binges for days at a time, with Marvin and mom driving around all of Dallas trying to find him in local bars. As a result, Marvin often stayed with his grandmother nearby. In high school Aday was bit by the theater bug and starred a handful of productions. He attended North Texas University for a bit, but dropped out upon his mother’s death. Marvin isolated himself in an apartment for nearly four months when a friend found him and convinced him to get away. He decided to go to the Dallas-Fort Worth airport and took the next departing flight. That plane took him to Los Angeles. The scenery gave him new life, he decided to start a band. The first name he came up with was Meat Loaf Soul, after a nickname he received in high school by his football coach due to his weight. In their very first recording session, Marvin hit a note so high he blew a fuse on the monitor. He was immediately offered three contracts, all of which he turned down. Their first gig was opening for Van Morrison’s band Them – and shortly after opening for Janis Joplin. After making some good contacts in the music business, he was asked to be in 1973 film The Rocky Horror Picture Show. Looking to capitalize on the success, Marvin convinced Epic Records to back an album and shoot music videos for promotion. 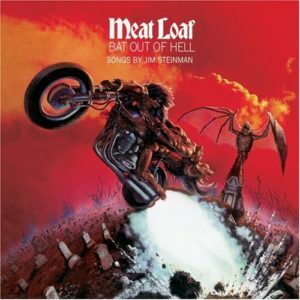 Eventually Bat Out Of Hell would be released in October, 1977. The end product was developed from a musical called Neverland – which was a stylized, futuristic version of Peter Pan. In the interim, Epic Records dropped Meal Loaf, and each record exec questioned his theatrical background, with famed Clive Davis asking him, “Do you even know how to write a song?” Eventually Todd Rundgren heard the album and found it hilarious – thinking it was a parody of Bruce Springsteen. Rundgren would go on to produce it, and they’d eventually find Cleveland International Records, a subsidy of Epic to release it. Absolutely fascinating story behind this record – and even more fascinating are the results. Everyone at the label hated it, critics said it didn’t fit any trends and it was immediately labeled ‘damaged goods’. Fast forward to 2017, Bat Out Of Hell to this day sells about 200,000 albums every year, and about 43 million to date. Not too bad for an album that almost never got made. The album definitely feels theatrical, almost playing like an opera or a very condensed musical. No questioning Meat Loaf’s vocal range, it’s second to none for male vocalists of all time. I would have never thought of the Springsteen comparison until reading Rundgren’s comments – but it does fit. It has that rural teenage rebellion feel, just with over-the-top arrangements. No doubt the label of this album being ‘out there’ at the time fits, but that change of pace is a bit refreshing – it was something totally unique in a time of rock dominated charts. Meat Loaf fell off the mainstream shortly after this album, hitting drugs and alcohol hard. He returned to popularity in the early 90’s with Bat Out Of Hell II and the track I’d Do Anything For Love. He also caught on with a whole new generation by being a part of the 1999 film Fight Club. He remains active in acting and music to this day – but he’ll never capture the lightning in a bottle he did with Bat Out Of Hell. Give it a shot today for $5 bucks, it’s a small slice of Paradise.